Maddie dog Harness was designed with you dog in mind. We have created a soft dog harness with the use of a Polartec fleece fabric lining and ripstop outer shell. Polartec is well known to provide warmth, comfort, shelter, and breathability. Polartec is used by companies like Colombia, Northface, REI for jackets, pants, gloves and other outdoor gear. Ripstop brings durability, abrasion resistance, waterproofing and is ideal for any application that requires material that won't fail under stress. Ripstop is commonly used for camping equipment such as tents and the outer shells of sleeping bags. It is also used to make hang glider and parasail wings, parachutes, hot air balloons, sails, kites, flags, banners and sports clothes. Maddie Dog Harness was designed by an expert technical designer. A lot of engineering and development went into the creation. Many dog breed specifications and size charts were reviewed to make sure we met breed specific requirements. We also found a local vendor who is able to produce top quality sewing, ensuring top of the line quality. 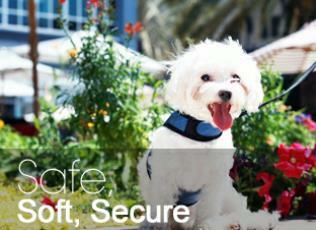 Maddie Dog Harness uses many precautions to make sure your dog is safe, secure, and treated humanely. Safety comes from our use of Velcro and a double D-ring enclose with independent stitching for a secure hold. Security can be seen in the fit and adjustable freedom that comes from the Velcro. And lastly, unlike a collar which solely distribute force around a dog’s neck. causing harm to your dog, a Maddie Dog Harness is made to go underneath your dog’s chest, allowing any force to be evenly distributed. Instead of yanking the dog's head, you can pull on the harness and the dog feels his entire center of gravity being moved. This is a much more humane way of applying force to a dog, when force is needed.